Dave Grohl has always been a man of big ideas. 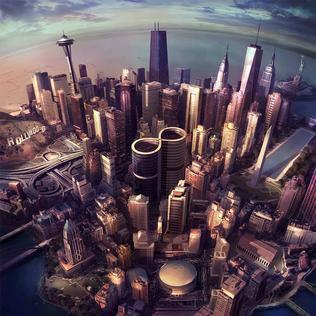 And the premise of Sonic Highways, the latest LP from the Foo Fighters, is an undeniably one of his biggest. Following in same the vein of past high-concept Foo Fighters albums like the half-electric half-acoustic In Your Honor or the recorded-in-a-garage-that-is-probably-nicer-than-most-people’s-houses Wasting Light, the band’s Eighth album finds the band invigorating their creative process by recording the album’s eight songs in different cities across America. Not only that but it sees an eight part documentary series accompany it, detailing the recording process as well as the musical history of the city each song was recorded in. The concept alone is enough to pique the interest of the band’s fiercest critics, surely? The album starts off with Something From Nothing, a song recorded in Chicago. It is, for lack of a better word, a weird song. Coming from someone who has heard every single Foo Fighters song from every single album, including b-sides they have never been so Led Zeppelin-esque in their execution. Is that a Mellotron half way through? Anyway the song failed to inspire originally but is a grower simply because it has so many parts to it that I find I hear something new every time I listen to the song. Some may see it as its biggest flaw however and it’s not one of the Foo’s better singles. The album picks up though, with the Washington, DC recorded Feast and the Famine. It is definitely the most full-throttle tune on the album, fitting as it pays tribute to Grohl’s hometown and the DIY punk scene he grew up in. Perhaps its most interesting element is its incorporation of the Washington, DC Go-Go music drum beat pioneered by bands such as Trouble Funk, a fact that you could only appreciate by watching the accompanying documentary episode. Nevertheless it’s a great song and a far cry from the proginess of Something From Nothing. What Did I Do?/ God As My Witness sees the band do their best Queen imitation. It evangelises the passion the residents of Austin, the city it was recorded in, have for their city and its nurturing of artistic freedom. The accompanying episode sheds light on the gentrification of the city however, which many see as curbing the artistic hospitableness it has provided for decades, which as a Londoner I can definitely sympathise with. As the episode moves through the streets, banners of ‘Keep Austin Weird’ are seen and shed some light on the line in the song that says ‘What can I do to preserve you?’. This is an example of the interesting way Grohl has penned the lyrics to the album, drawing on inspiration from the interviews he has conducted with people from the city’s he is recording in. This technique can sometimes come across as a little forced on some of the album’s tracks, but here it works just fine. In The Clear is another great song, super melodic and catchy. However in my opinion doesn’t utilise the New Orlean’s Preservation Jazz Hall band who appear on it to full affect. I’d never thought I’d say about a Foo Fighters song ‘Needs more Trombone!’, but such is the diversity of the album. Not all the songs are winners unfortunately. The song Outside drags along a bit, as does the Seattle recorded Subterranean, which can’t even be saved by the inclusion of Death Cab for Cutie’s Benjamin Gibbard. The same can be said of the album’s seven minute closer I Am A River, which funnily enough sounds more like a Death Cab song than Subterranean. However the album is saved by its brevity and doesn’t extend to a length that makes it torturous, a fault that I found with the band’s last album Wasting Light. All in all, the album is a nice enough addition to the Foo’s canon. A final note though, and something that can’t be said about every album: The documentary is better. If you are interested in the history of music and you want to watch a passionately put together piece on the importance of where art comes from, I highly recommend it. One criticism with it however: no episode set in Minneapolis? The home of Bob Dylan, Prince, the Replacements and Husker Du is sorely missed from the creative process I feel. And Detroit as well. Here’s hoping to a Sonic Highways Two.